Rosen, D. , ed. 1990. 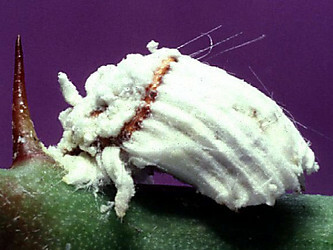 World Crop Pests, Volume 4A, Armored Scale Insects: Their Biology, Natural Enemies and Control. Elsevier, Amsterdam, pp. 97–128. Cook, L.G., Gullan, P.J. & Trueman, H.E. 2002. A preliminary phylogeny of the scale insects (Hemiptera: Sternorrhyncha: Coccoidea) based on nuclear small-subunit ribosomal DNA. Molecular Phylogenetics and Evolution 25:43– 52. Foldi, I. 1997. Defense strategies in scale insects: phylogenetic inference and evolutionary scenarios (Hemiptera, Coccoidea). Memoires du Museum National d'Histoire Naturelle (N.S.) Serie A, Zoologie 173:203–230. Gullan, P. J. & Cook, L. G. 2007. Phylogeny and higher classification of the scale insects (Hemiptera: Sternorrhyncha: Coccoidea). Pages 413-425 in: Zhang, Z.-Q. & Shear, W.A., eds. Linnaeus Tercentenary: Progress in Invertebrate Taxonomy. Zootaxa 1668:1–766. Gullan, P.J. & Kosztarab, M. 1997. Adaptations in scale insects. Annual Review of Entomology 42:23–50. Hodgson, C. & Foldi, I. 2006. A review of the Margarodidae sensu Morrison (Hemiptera: Coccoidea) and some related taxa based on the morphology of adult males. Zootaxa 1263:1–250. Koteja, J. 2004. Scale insects (Hemiptera: Coccinea) from Cretaceous Myanmar (Burmese) amber. Journal of Systematic Palaeontology 2:109–114. Miller, D.R., Gimpel, M.E. & Rung, A. 2005. A Systematic Catalogue of the Cerococcidae, Halimococcidae, Kermesidae, Micrococcidae, Ortheziidae, Phenacoleachiidae, Phoenicococcidae and Stictococcidae (Hemiptera: Coccoidea) of the World. Intercept Limited, Wimborne. Miller, D.R. & Kosztarab, M. 1979. Recent advances in the study of scale insects. Annual Review of Entomology 24:1– 27. Williams, D.J. & Watson, G.W. 1990. The Scale Insects of the Tropical South Pacific Region. Part 3. The Soft Scales (Coccidae) and Other Families. CAB International Institute of Entomology, Wallingford, Oxon, UK, 267 pp.